Fernando Onega anchors Antena 3's main evening broadcast from Brussels on May 1st, 1998, the day when the Euro was oficially presented. Also from May 1998, SIC's midday newscast is presented from the field by Rodrigo Guedes de Carvalho at Braga, in northern Portugal. First minutes of TVA's Les Nouvelles in September 1983. 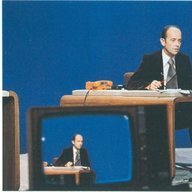 No intro and no music: it goes straight to the presentation of the first story from anchor Jacques Moisan, similar to the CBS Evening News at the time. Also from September 1983, it's Radio-Canada's Le Téléjournal with Jean Ducharme. ATN7's weekend edition of Seven National News with Paul Marshall from May 1983. A closer from Les Nouvelles TVA in 1985 with Jacques Moisan. Plus, the full theme used by the newscast in the early 1980s! A promo and a CFTM news update in December 1988. Ici Montreal was the name of the local newscasts that aired on CFTM at the time. Some interesting reports on the ITV's franchise auction in 1991 that changed British TV forever. Bruce Gyngell, the chief executive of TV-am at the time said (and heard in the news) that Sunrise Television (stay with me here) would be bankrupt in 1994. GMTV ended up lasting longer than TV-am at 17 years. Final seconds of the midday edition of Nuevediario in 1991, presented by Mabel Marchesini, Juan Jose Maderna and Sergio de Caro. A compilation of STV's Scotland Today intros from 1988 until 2009. A 5-minute Nine Newsbreak with Jo Hall in July 1998. These short news bulletins used to air during primetime. Most of an edition of New Zealand's TV2 Eyewitness News in 1986 with Angela D'Audney in Auckland and Lindsay Perigo in Wellington. Also from 1986: an excerpt of HSV7's former current affairs show Day by Day, hosted by Mark Day. The show was canceled in 1987 when HSV7 was purchased by Fairfax. Day by Day was replaced by Terry Willesee Tonight, produced out of ATN7 Sydney. Part of the midday edition of Radio-Canada's Le Téléjournal in July 2007, anchored by Claudine Bourbonnais. A full edition of Tagesschau from June 3, 1998, read by Susan Stahnke. A segment of Telefe Noticias in November 1997, anchored by Rosario Lufrano, with a report on an armed robbery. Thanks to the "magic" of the editors, that tragic story is turned into a "cinematic", dramatic event. At the time, it was unusual to air reports with background music. Brazil's CBS Telenoticias reports on the 5000th show of The Price is Right in April 1998. Infro of TSR's midday news in September 2002, presented by Emmanuelle Bressan. The intro of Italia 1's Studio Aperto, used between 1996 and 2002. Intro and partial segment of the Sunday edition of Teletrece in June 1986, read by Augusto Gatica (he was a staff announcer at the station and used to voice IDs and promos as well). The intro also included the stations where the program was being relayed. Clock, headlines and intro of Rede Globo's Jornal Nacional in July 1984 with Cid Moreira and Celso Freitas. A full broadcast of the late edition of Westcountry News from 1996, read by Linda Ward. National forecast and closer of Telefe Noticias in 1993, with Rosario Lufrano and Carlos Asnaghi.